Konica Minolta has launched a new print engine featuring High Chroma technology, the AccurioPress C83hc. This will replace the bizhub PRESS C71hc. This new machine is a niche product: its main fields of application will lie in the field of brochures for cosmetics, for example, where graphics must be high impact and high quality. According to the manufacturer, the AccurioPress C83hc is able to express a broader color gamut than the CMYK technology used in conventional toner printing, particularly with regard to the brightness and fidelity of the reproduction of pinks, violets and greens. Grant Thomas, product marketing manager at Konica Minolta, said: "With its wide color gamut, AccurioPress C83hc High Chroma toner creates new business opportunities for printing. It provides colors closer to RGB, which is perfect for printing studio photos, for example, photo books, nature photos, illustrations, computer graphics, web pages, and many others." Among the main features of the AccurioPress C83hc is an electrophotographic printing system producing colors close to RGB, which can not be achieved with CMYK printing systems. In print mode, colors that are both close to RGB and CMYK can be obtained with a single machine. Automated color adjustments and registration are made possible by the intelligent quality optimizer (IQ-501) which improves quality, productivity and, according to Konica Minolta, can enable print operators to save up to 60% of their time, and also increase print productivity by as much as 20% - thus enhancing profitability. 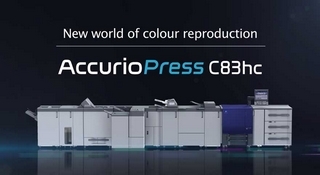 The AccurioPress C83hc prints at up to 81 ppm onto A4 and at 45 ppm onto A3, offers high-capacity paper handling and high-end finishing options for high-volume print jobs. Paper weight compatibility is up to 350 g / m², and the machine supports a wide variety of media, including envelopes, banners, and textured media. It also offers the ability to print on long banner format sheets: up to 1300 mm long single-sided and up to 762 mm in automatic duplex mode.